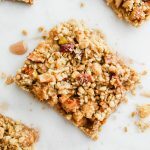 These Apple Crumble Bars with Cinnamon Spice Glaze are loaded with fresh juicy apples and your favorite Fall spices like nutmeg, clove and cinnamon! They make the perfect breakfast, dessert or snack! You guys. Can you believe it’s already September?! Of course, here in North Carolina, you’re lucky if the temperature is in the high 80’s. Seriously, that’s what’s considered a “cool” day where I live. I know I sound basic but I don’t care. I’m ready for falling leaves, big sweaters, comfy leggings and stuffing all of the Fall themed desserts in my mouth. All while burning a Pumpkin Spice candle. AND I HAVE NO REGRETS! But really, I saw a funny meme the other day basically saying “Can we just let those people who really love PSL’s and everything pumpkin just enjoy their life in the Fall instead of mocking them? !” And I 1000% percent agree with it! LET US LIVE. Recently, I posted a Instagram story asking what types of Fall recipes that you guys would like to see! While there were a few obvious pumpkin answers, a lot of my followers said they wanted to see apple desserts on the blog! So, I decided to start out Fall with these Apple Crumble Bars with Cinnamon Spice Glaze. Let me give you the low down on these. They’re made with: all pantry staples. Seriously, no fancy flours or sugars – just the easy, accessible stuff. 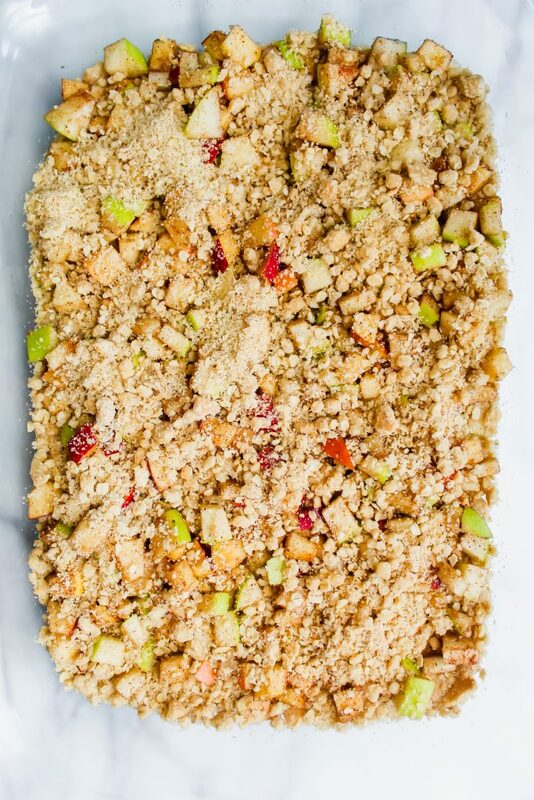 They’re loaded with fresh diced apples – I used both a gala for added sweetness and a granny smith for some tartness. They have GRAHAM CRACKER CRUMBS in the crust for extra cozy vibes. Oh, and there is a cinnamon spice glaze on top that soaks into the bars that makes them so extremely extra mouth watering. It’s like eating a brown sugar cinnamon pop tart with fresh apples mixed in. The apples are juicy and tender and not overly sweet. 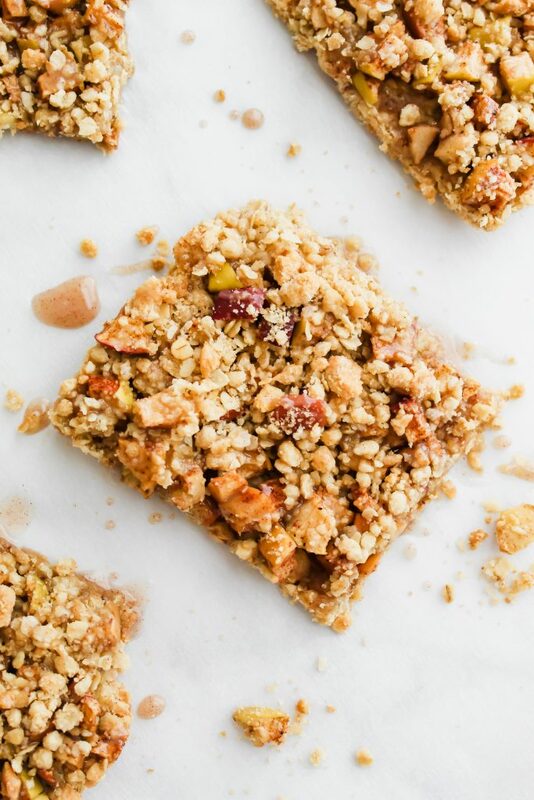 The crumb has the perfect amount of oats/flour/brown sugar ratio to make it a little crunchy and crumbly. Oh, and did I mention that the crust DOUBLES as the crumb topping which is a major baking win! 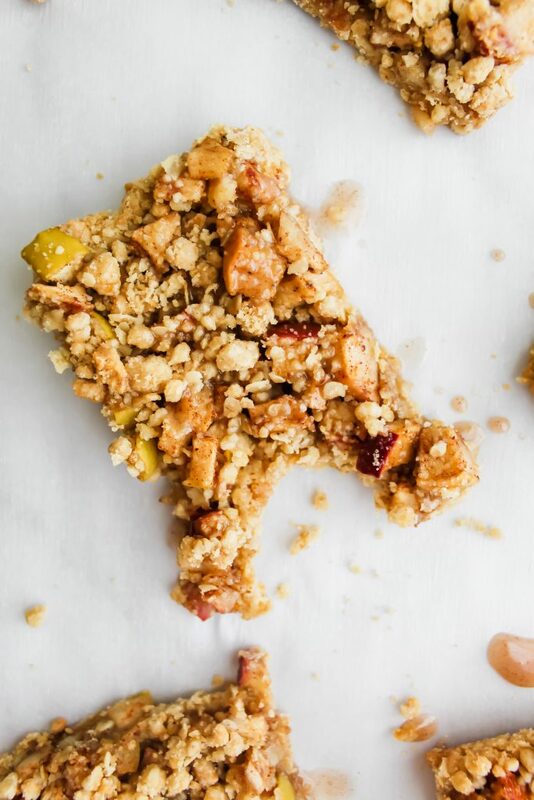 These Apple Crumble Bars with Cinnamon Spice Glaze are truly the best Fall dessert! So….let me tell you how to do it! Your mouth is probably already watering right? Right. So, mix all of the ingredients listed above in a bowl. Press ¾ of the mixture down into the bottom of a buttered pan. I used a 9×13 but feel free to use a smaller pan if you want a thicker crust. Side note: SAVE the remaining 1/4 of the mixture. Yes, there may be a spoon in it. And yes, it may be a delicious mixture of oats, brown sugar and butter. But don’t be like me and eat it, okay?! Pop the crust in the oven for about 5 minutes or so just to help let it set. Next, chop up those gorgeous apples! Dice them very small so they will actually stay on the bars. Coat them in more sugar, and some extra cozy fall spices. Pour the apples on top of the crust and then top with the remaining crust/crumble mixture (which I know you didn’t eat with a spoon because you have much more self control than me). 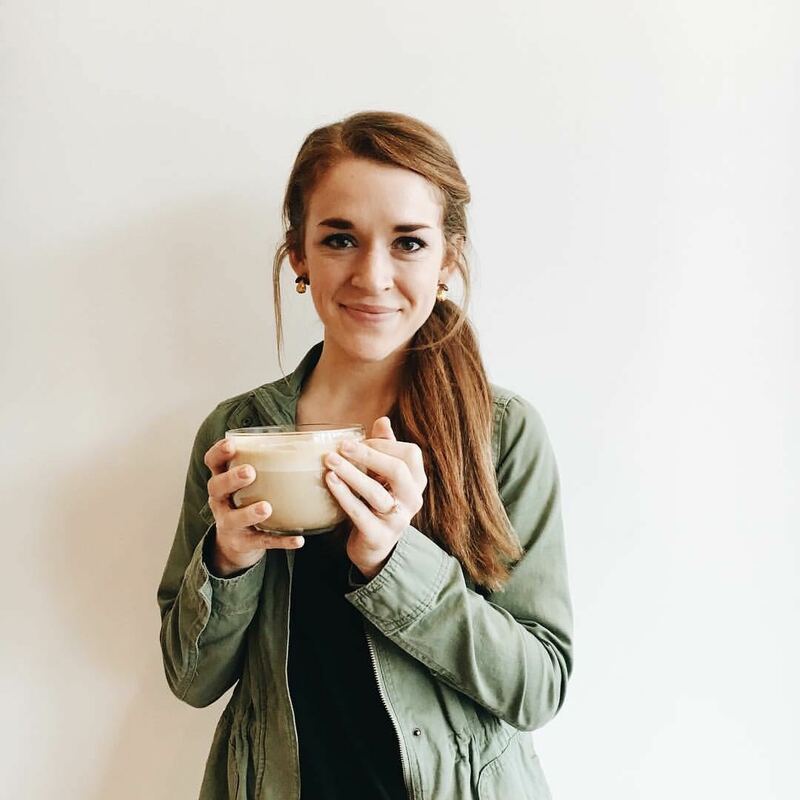 While it’s in the oven baking and your house literally smells like a fancy soy wax apple crumble bar candle, go ahead and make that heart eye worthy cinnamon spice glaze. It’s not at all anything fancy – just delicious. Mix some powdered sugar and a splash of milk in a bowl. Add in some cinnamon. Mix until you reach your desired consistency. Once again, don’t be like me and eat several spoonfuls of it and have to start over. Why is sugar so enticing??! Okay, so after the apple crumble bars are done, make sure and let them cool before you smother them in the glaze. You may want to let them actually cool unlike I did before you cut into them or else they will fall apart. Just have patience, young Padawan. 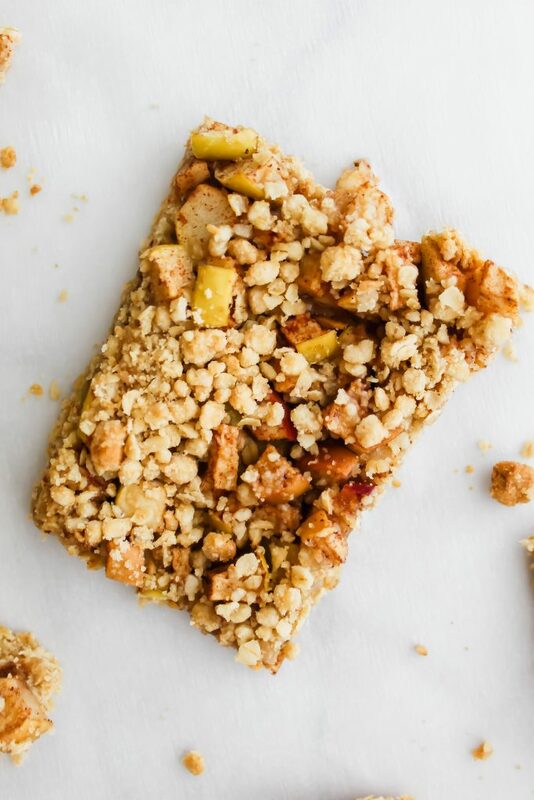 And the Apple Crumble Bars with Cinnamon Spice Glaze will soon be in your mouth. Hope you enjoy the very first Fall recipe of the season! There are plenty more coming your way so keep a lookout! Preheat oven to 350 degrees. 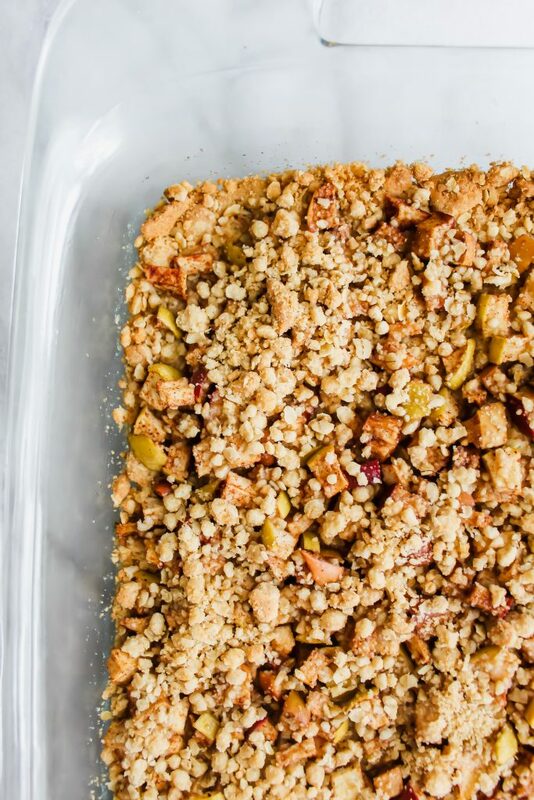 In a large bowl, mix together the flour, oats, brown sugar, melted butter, graham cracker crumbs and a pinch of salt until well combined. Butter an oven safe baking dish. 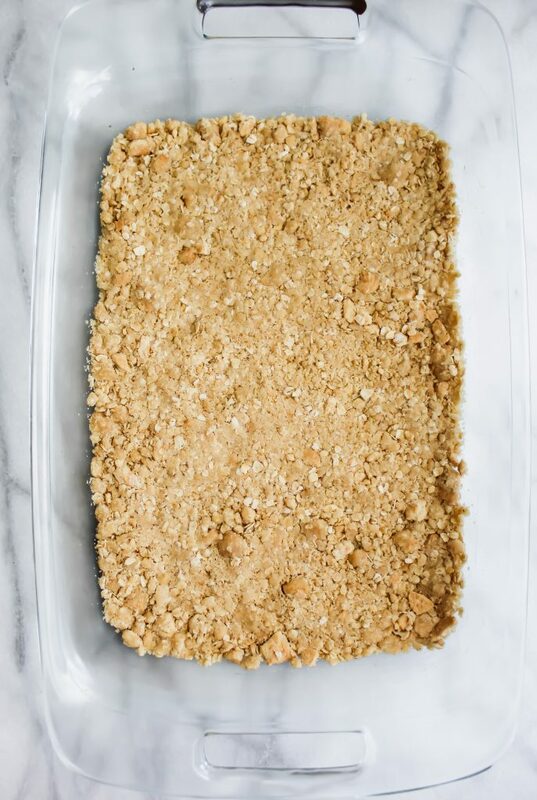 Add 3/4 of the crumb mixture into the bottom of the pan and press down gently with your fingers, spreading it out evenly. Save 1/4 of the mixture and set aside. Bake for 5 or so minutes to let the crust set. Meanwhile, dice your apples into very small pieces. Mix in a bowl with brown sugar, cinnamon, nutmeg and ground cloves. Once the crust has set, add your apples to the middle and spread out evenly. Sprinkle the remaining crust mixture on top of the apples. Bake for 25-30 minutes, or until your apples are juicy and cooked through. Mix together your powdered sugar, cinnamon with a splash of milk until you reach your desired consistency. 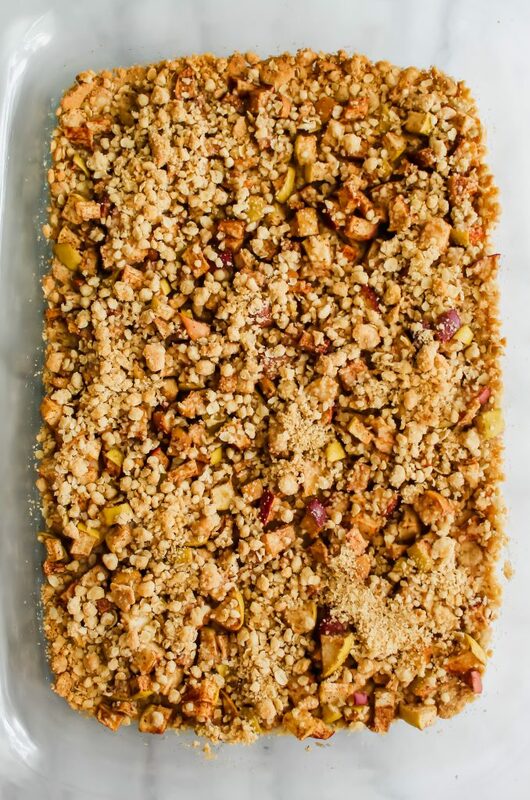 Let the apple crumb bars cool completely. Drizzle with the cinnamon spice glaze and enjoy! I used a 9x13 baking dish for this recipe. I would highly recommend using a smaller dish if you desire thicker crust. Make sure you dice your apples into very small pieces or they will make the bars fall apart! This dessert screams coffee and cream. I think it would really hit the spot.